The Florida State Seminoles will look to tie an ACC record for consecutive conference victories this Saturday when they play Georgia Tech. With Florida State’s 41-21 victory over Louisville on Saturday the No. 9 Seminoles (6-0, 4-0) moved one step closer to making ACC history. 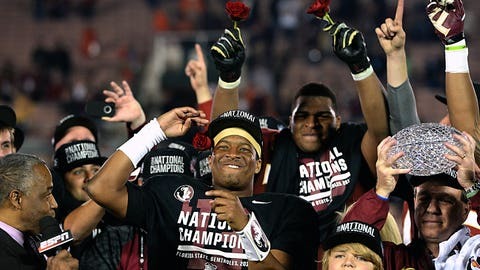 With the win, head coach Jimbo Fisher’s club earned its 28th consecutive ACC victory, putting the Seminoles on the brink of tying the conference record of 29, held by former FSU coach Bobby Bowden. The legendary former Seminoles coach began his streak in 1992 and three years later it ended when FSU lost 33-28 at Virginia. Florida State’s current streak began on Oct. 13, 2012 with a 51-7 victory over Boston College thanks to a career-high 439 passing yards by quarterback E.J. Manuel. The Seminoles will attempt to pick up win No. 29 this Saturday when they play at Georgia Tech (2-5, 0-4) at 7 p.m. Ironically, Georgia Tech was the same team that Bowden beat to earn his 29th straight ACC victory.